The Aztec Empire started sometime around the mid-1350s in what is now Mexico. It was a three city-state which, at its height, had a population of 5 million people. Its capital city, Tenochtitlan (which is today Mexico City), had a population of 200,000. Their culture was complex and rich, with a strong economic system. They created the 365 day agriculture calendar. The Aztecs also had a fierce army that helped feed their bloodthirsty culture. Unlike many other ancient warriors, Aztecs didn’t want to kill their enemies on the battlefield. Instead, they wanted to capture them. Killing an enemy was actually considered to be clumsy and the Aztecs believed it took much more skill to capture an enemy alive and bring them back to the famed Aztec capital, Tenochtitlan. Since it was such a skilled task, it became a way to measure a man’s ability as a warrior. It was how he moved up in the ranks. 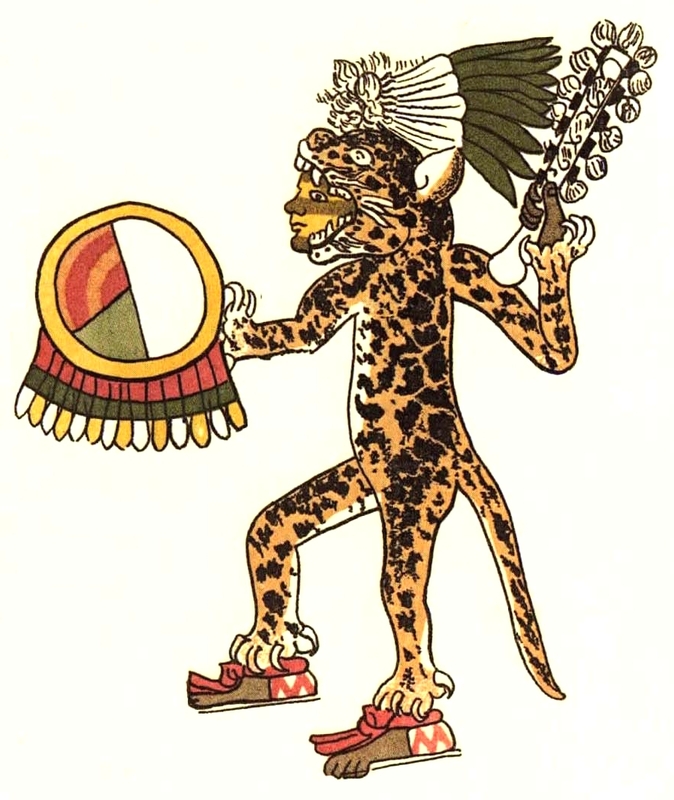 For example, for an Aztec to become a Jaguar or Eagle, he needed to capture four enemies. The Aztecs had strong religious beliefs. They had hundreds, if not thousands of gods, and the gods were responsible for everything. They were the reason the sun rose, and the reason rain fell from the sky. Aztecs also thought that the gods needed to be nourished with blood. One way they fed the gods was through bloodletting, which involved an individual cutting themselves. People higher up in society were expected to give the most blood. Another way that the Aztecs fed their gods was by killing enemy warriors. This is why capturing enemies alive was so important. They were needed for sacrifices to the gods. The practice of hunting and capturing enemy soldiers was called the terribly misleading War of the Flowers, or the Flowery Wars. It was a decree of constant war, because sacrifices were always needed. The War of the Flowers was waged on other city-states in Mesoamerica, but the Aztecs focused heavily on raiding the nearby city of Tlaxcala. As for the rituals, most sacrifices were the same. One thing that did vary was how many people were sacrificed in one ceremony. It could range from one, to thousands. The sacrifices were taken to the top of a pyramid and placed face up on an altar. The priest would make an incision under the ribs, and then stick his hand in the wound, reach into the chest cavity, find the heart, and yank it out while it was still beating. The victim likely would have felt all of this, by the way. Once the heart was out, it was thrown into a fire. The body was pushed down the steps of the pyramid. If the person who was sacrificed was noble, or held some importance, they were often carried down. The most devastating weapon used by the Aztec warriors was the Macuahuitl, which means “Hungry Wood.” While the Aztecs were advanced in many ways, one technology they didn’t develop was forging, so they had no metal weapons. Instead, the Macuahuitl was a flat wooden paddle with razor sharp volcanic stones called Obsidian embedded in its side. Apparently the weapon was powerful enough to decapitate a human. According to a report from invading Spaniards, an Aztec warrior even used a Macuahuitl to decapitate a horse in one blow. The story about the horse decapitation was tested on the television show The Deadliest Warrior. With a few whacks, the stand-in for the Aztec warrior was able to cut through a horse’s neck made of ballistic gel. The afterlife of most religions usually rewards people for how they lived. It was a bit different in the Aztec religion, because how someone died was the deciding factor on which afterlife they went to. There were four different afterlifes. The warrior’s afterlife showed exactly how much the Aztecs loved war, because if someone died in battle or they were sacrificed, their souls would go to an afterlife which involved even more war. In that afterlife, which was in the west, they would help the god Huitzilopochtli fight against the darkness to ensure that the sun would rise. They stayed in this afterlife for four years before returning to Earth as a humming bird, or some other exotic bird. As for the other afterlifes, the one in the east was for women who died during childbirth. They were treated similar to fallen soldiers and sacrifices, and they helped prepare the sun for its journey into the underworld. In the south was an afterlife for people who died because they were struck by lightning, drowned, or died from leprosy or another sickness. In that afterlife, there was plenty of food. Finally, there was the afterlife in the north called Mictlan. It was for people who died ordinary deaths, like from old age. In that afterlife, souls had four years to pass through eight levels of challenges, which included climbing an obsidian mountain and passing through an area full of beasts that eat human hearts. The ninth level was where their soul finally found rest. The Aztecs had no official standing army. Instead, every male in the culture was trained for battle. But their training would start rather late, compared to many other warrior cultures. Aztec boys would live with their families through adolescence, where they would provide manual labor around the home. They would also learn essential skills that would help them become good soldiers, like hunting. However, boys of noble birth probably started their training much earlier in life, sometimes as early as six-years-old. When the boys had reached the age of 13, they were sent for their training in the capital, on a training ground called the Calmecac. There, they were taught to read and write. They were taught the calendar and studied astronomy, among other academic topics. They also learned practical skills that revolved around daily chores. When they were 15, the boys moved onto warrior training called the Telpochocalli, where veteran warriors taught the boys how to fight and instilled courage in the young men. 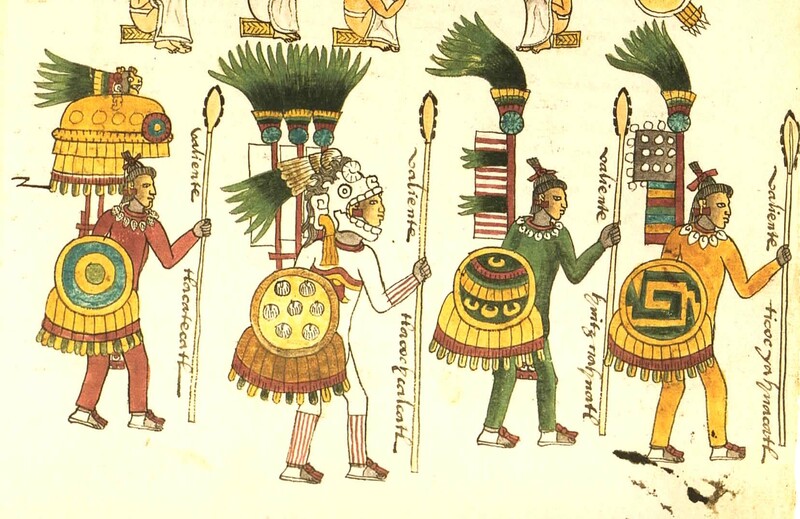 The Aztec army had three different levels, and the first level consisted of the Jaguars and Eagles. There wasn’t much difference between the two besides the outfits that they wore. The two ranks weren’t always separate either. For example, there are records of high-ranking warriors being called Eagle-Jaguar Warriors. Above the Jaguar and Eagle Warriors were soldiers who were able to capture five or six enemies, and people who reached that rank were called Otomies. At this level, warriors would be given their own shield and Macuahuitl. Above that was the most elite fighting force in the Aztec army, the Shorn Ones. They gained that name because they shaved their head, but kept a long braid of hair on the left side of their head and wore a yellow uniform. To become a Shorn One, the warrior had to capture at least 20 men. The Shorn Ones also had to take a vow, and that was they were not allowed to take a step backwards during battles. While Aztecs Jaguars and Eagles had similar roles in the Aztec army, they dressed completely different. As you can probably guess, they dressed like their namesakes. Eagles were adorned with feathers, and they wore wooden helmets that made it look like the warrior’s face was coming out of the mouth of the Eagle. The Jaguars, on the other hand, wore the skin of a jaguar, and their helmet looks like a jaguar. It’s believed that the point of the uniforms was for psychological warfare. Surprise attacks from fast moving and agile animal-men were supposed to frighten their enemies. Besides their outfits, they also banged drums and made a lot of noise, adding even more pandemonium to the attack. This would cause their enemies to panic and possibly scatter, which would have made them easier to capture. Human sacrifices were important to the Aztecs and most of the time the victims were sacrificed in the manner mentioned in entry six. However, that wasn’t the only sacrificial ceremony they did. One of the more notable sacrifices was to Huehueteotl, the god of fire and wisdom. There were two different ways that the ceremony was done and both were horrifying. According to Time magazine, the first way is that victims would be thrown into a pit full of hot coals, while priests in black danced. Before the victim died, they were pulled up by hooks and placed on the altar. Then their blistered chest was cut open and the heart was removed. In a variation of the ceremony, which happened every 52 years, after the heart was removed, the priest would try to start a fire in the chest. If the fire was successful, then the empire would stay alight for the next 52 years. However, if the fire didn’t start, that would be a sign that a monster called the Tzitzimime was coming and he would use the darkness to hunt and eat all of mankind. 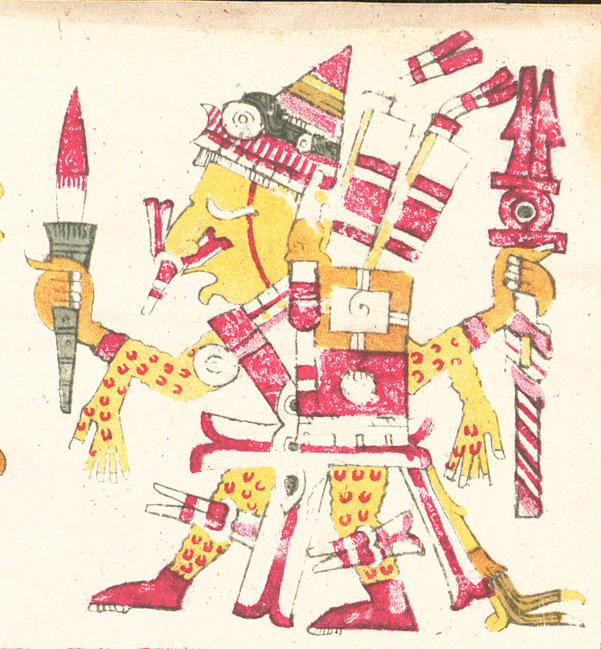 The most disturbing ritual that Aztec warriors collected sacrifices for was the tribute to Xipe Totec, or “Our Lord the Flayed One.” That was the god of spring and agriculture, who helped the transition of boys into men. Xipe Totec was celebrated every spring in March. There were three gruesome rituals that were performed in his honor. The first ritual involved the heart being removed as usual, but then the victim’s skin was flayed. The skin was dyed yellow, and priests wore the skin, which they called teocuitlaquemitl or in English “golden clothes,” for 20 days. Shedding the skin was symbolic of the Earth changing from winter to spring. The second way a victim was sacrificed was that they were tied to a frame and shot with arrows, slowly bleeding to death while attendees sang hymns. The third, and perhaps oddest way to die during the rituals to Xipe Totec, was called Gladiatorial Sacrifice. Outside of the temple dedicated to Xipe Totec, a captured warrior could be tied to a big stone and he would be forced to drink Octli, which was an alcohol drink. They were given primitive weapons and barely any protection. The warrior then had to fend off four fully dressed and heavily armed Aztec warriors, two Jaguars and two Eagles. If the Aztecs wounded the sacrifice, he was taken to the altar where he had his heart pulled out and possibly flayed. However, if the sacrifice fended off the two Eagles and two Jaguars, a left handed warrior would be added to the mix. The fight would go on until the warrior was injured, and then he’d be sacrificed. All the way back in entry nine, we mentioned that many of the sacrifices came from the neighboring city of Tlaxcala. What’s interesting is that the Aztecs were an incredibly powerful civilization and could have very easily taken over Tlaxcala, but they didn’t. Instead, they more or less used the city as a “farm” for human sacrifices. For reasons that should be obvious, the people of Tlaxcala didn’t like being treated this way and this ultimately proved to be the Aztecs downfall. When Spanish Conquistador Hernan Cortes and 400 soldiers marched into Mexico they were led to the Aztec capital, where Cortes was supposedly welcomed because he had light skin like the god Quetzalcoatl, who was prophesied to return to Earth. This allowed Cortes to get close to the Aztec leader, Montezuma II, and his inner circle. Despite being vastly outnumbered, the Spaniard’s weapons were much better than the Aztecs and they quickly took the upper echelon of the Aztec civilization hostage. The noblemen were executed during this time, and somehow Montezuma died as well. Eventually, the Aztecs were able to chase the Spaniards out of the capital, but they wouldn’t stay away long. The Spaniards teamed up with the Tlaxcalans and by August 13, 1521, the Aztecs were defeated. It’s believed that almost a quarter of a million Aztecs were killed during the conquest. After slaughtering the people, Cortes had the city razed, and built Mexico City in its place.